There’s been a lot of discussion lately about the relationship between reality and photography. There’s been discussion about what constitutes a "photograph." These aren’t new discussions, of course (although given flickr’s NIPSA rules, they are increasingly personal and pertinent). This seems an appropriate time to discuss the work of Spanish photographer Joan Fontcuberta. Fontcuberta has devoted himself to creating images intended to call the integrity and authority of traditional photography into question. His work is deliberately provocative, intentionally iconoclastic, and usually tinged with a wickedly sharp sense of dark humor. He is not shy about injecting his political beliefs into his photography. Like so many photographers, Fontcuberta prefers to create a series of images in order to more thoroughly explore the issues he finds of interest. 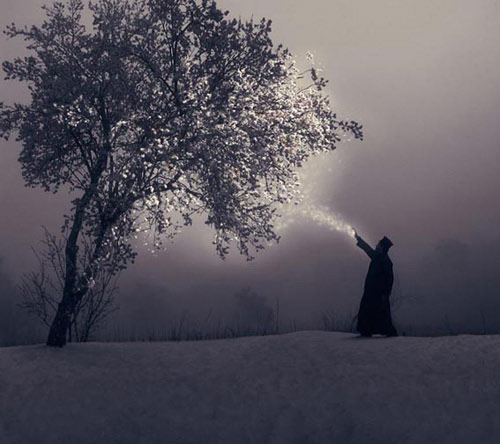 Some of these series are very clearly products of his artistic imagination, and the photographs are obviously not intended to represent reality. For example, his recent series Miracles & Co documents an imaginary isolated sect of monks who have developed miraculous…and totally useless…powers. Fontcuberta enjoys finding technology created for one purpose and using for a totally different purpose. For example, his Orogenesis series uses software developed by the military to render a three-dimensional terrain image based on scanned two-dimensional photographs/maps (you scan a flat satellite image of a valley, and the software will create a 3D version of the terrain suitable for training pilots to fly through the valley). Instead of scanning satellite photographs or maps, though, Fontcuberta scanned paintings by such disparate artists as Gainsborough, Cézanne, and Dalí. The result were strange, three-dimensional "terrain" maps of places that don’t exist. Similarly, Fontcuberta used photo-imaging freeware and Google’s image search engine to create a series of photomosaics based on photographs he found in the public domain. 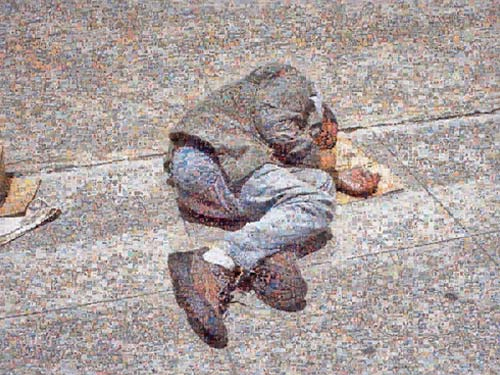 The following composite image was created from 10,000 separate photos he obtained through a Google image search of the names of the 25 richest persons in the world according Forbes magazine (I could find no credit given for the original photo of the homeless man). Fontcuberta’s work is incredibly diverse. In Sputnik he created a fictional account of a Soviet cosmonaut who was lost in space. He did something similar with Pin Zhuang, a sci-fi series of images that purportedly represent a variety of Chinese spacecraft assembled from the wreckage of a U.S. spy plane that crashed in China. He has photographed bugs splattered on the windshield of a car windscreen during a drive at night, turning the mashed bodies into images of a starry sky. His work even includes spoofs of scientific discoveries. In the late 1980s Fontcuberta received some criticism for his series Dr. Ameisenhaufen’s Fauna. 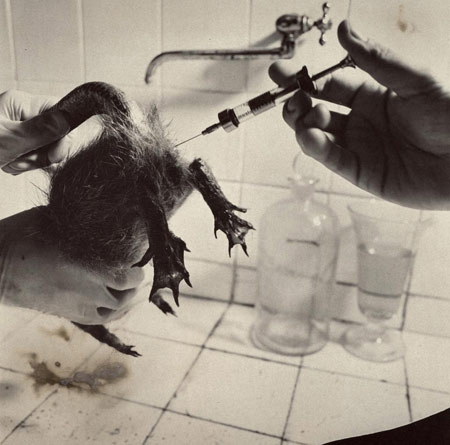 Some of the photographs (along with drawings and sketches) were originally published as illustrations for a serious piece of journalism examining the life and career of the fictional Dr. Ameisenhoufen and his amazing discoveries. At first glance, the article was utterly convincing; on closer examination, it was totally obvious that it was a spoof. In later gallery and museum shows the series (and Fontacuberta himself) received criticism for calling "the authority of the photograph" into question. The series was derided more as a literary hoax than a work of visual art. Fontcuberta, who teaches photography in a Fine Arts program at a university in Barcelona, has stated photography "should be taught not in fine art schools…but in philosophy schools." He insists photography is a way of thinking more than a way of art, and he sees his role as undermining the legitimacy and authority of the photograph as a depiction of unquestioned reality.